Play space design in the UK has undergone a renaissance. Lottery and government funding (while it lasted), inspirational ideas from overseas, and a more balanced approach to risk have all helped to fuel a growing number of great places for play. I suspect that most UK readers of this review can think of at least one new public playground in their area that looks altogether more inviting, engaging and challenging than anything that went before. For some at the forefront of this movement – and I include myself here – items like the ‘springy chicken’ epitomise an impoverished way of thinking about what appeals to children. So when Barbara Hendricks in her book Designing for Play calls the ‘spillophøne’ – a closely related species – “a beautiful design”, I know my views of what makes for a good play space will be challenged. Hendricks – a play space designer who has collaborated with the spillophøne’s manufacturers, Kompan – makes the case in her book for a design philosophy that resists adult ideas of what is ‘good for children’, instead arguing for a strongly child-centred approach. The focus is firmly on dedicated outdoor play space, and largely on the pre-adolescent age group. Spaces for teenagers – where the design challenges are quite different, with physical risk, performance and sociability coming to the fore – are all but ignored. So are public spaces such as streets, squares and shopping centres, and the broader concept of a child-friendly public realm. This is a missed opportunity, since ideas about playability and flexible, shared use are gaining ground amongst urbanists. Sadly, Designing for Play fails to offer a clear design philosophy. Instead, Hendricks devotes many pages to opinionated and at times meandering debate on contemporary childhood themes such as commercialism, aesthetics, technology, education and nature. This last topic is explored through a particularly extended and unenlightening attack on the ‘nature playground’ movement. These criticisms were well made in a review of the first edition by Prof Robin Moore, a leading authority on outdoor play. So it is all the more disappointing that this new edition has largely failed to address them. Hendricks is clear that her book is no ‘how-to’ guide. She is right that there is no simple recipe for a good play space, just as there is none for a good restaurant, museum or town square. Nonetheless, she could have said so much more about the ingredients, and what a good design process looks like. There are also some hot design topics that are ripe for thoughtful exploration. Nature is one, but others include risk, the inclusion of disabled children, social safety, community engagement, and the constraints imposed by management and maintenance. Search hard, and you will find some gems, such as a thought-provoking discussion of the perils of an equipment-centred, wheelchair-obsessed focus on inclusion (pp 158-9). Likewise, Hendricks’ remark “the most important loose part on a playground is the children” (p.102) is a wonderful aphorism that merits unpacking. Yet nowhere are these nuggets pulled together into a coherent whole. What is more, the design and structure of the book, with text-heavy pages and only two detailed case studies, makes it even harder for the budding enthusiast to engage with the content. Coincidentally, while I was writing this review, Planning for Play – long out of print – was made available as a download. Thanks are due here to Paige Johnson, whose playscapes blog is consistently quirky, thought-provoking and inspirational. This book, written by tireless play champion Lady Allen of Hurtwood, is full of insight, using a simple structure, well-chosen case studies and plentiful photos and diagrams to make a compelling case for more playful outdoor space. I am sure that Hendricks is just as passionate and committed as Lady Allen was about the value of great places for play. I suspect she has just as many interesting things to say. I just wish she had Lady Allen’s clarity and focus. If she could take her cue from the godmother of adventure play, the third edition of her book would have rather more to say about good design, and be rather less concerned to come to the defence of springy chickens. Copyright for this book review is held by Wiley. The review is due to be published by the journal Children & Society. Reproduced with permission. This entry was posted in Play spaces, playground and tagged design, Lady Allen, playground, public space. Bookmark the permalink. An interesting juxtaposition Tim, and good to see that Lady Allen’s vision is still alive (and accessible via Amazon! ), but I’m curious that you didn’t triangulate your discussion to include the book that has had most influence over recent play space designs (on these shores at least): Play England’s Design for Play by Aileen Shackell, Nicola Butler, Phil Doyle and David Ball. Hi Adrian, and thanks for the feedback. 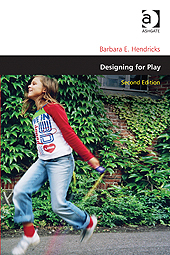 The review was commissioned by Children & Society, so I naturally wanted to focus on Designing for Play (not that they paid me – but they did give me a copy of the book). The brief nod to Planning for Play helped to underscore my criticisms, and also allowed me to announce the fact that it had just become available online. I am a big fan of Design for Play. But to try to bring it into the review as well would, I think, have stretched my brief too much, given the space available.